Santa Clara, CA – September 20, 2007 – Milestone Internet Marketing, Inc., (Santa Clara, CA) announced today that its Grand Velas Resort Website (www.grandvelas.com) won the Web Marketing Association’s 2007 International WebAward for Standard of Excellence in the Hotel and Lodging industry. 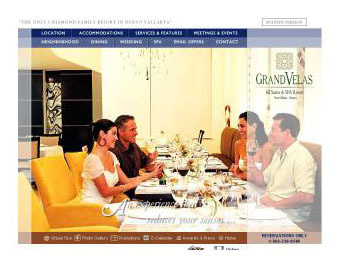 The Grand Velas All Inclusive Suites & Spa Resort in Neuvo Vallarta, Mexico is a 5-diamond luxury hotel that needed to give their website and web presence rejuvenation. Their old website did not position well for on search engine results, and had low traffic and conversion. Milestone created a new website for Grand Velas to reflect the resort’s luxurious and relaxing atmosphere. The website targeted their key market, which is primarily leisure vacationers, honeymooners, spa travelers, destination wedding guests, and corporate travelers. Visitors to the site increased 200% within three days of launching the new website and again increased 30% when RSS feeds and online video for website were launched. Website also generated significant new phone call activity. The resort is ranking high in the first place for several search terms on Google and other search engines. The new website is generating significant additional revenue and has already generated ROI of greater than 10X within a short 6 month period. Milestone Internet Marketing, Inc. is a leading provider of Internet marketing solutions for the lodging industry. Milestone’s portfolio of services included Website Design, Search Engine Optimization, Pay-per-Click marketing, Email marketing, and several Web 2.0 initiatives like Online Videos, Blogs, RSS, etc. Milestone currently works with over 500 hotels and drives over $70M in annual revenue for its clients. Milestone is a preferred vendor for several major lodging industry brands and works with some of the leading management companies in the US. Milestone is also well known as a lodging industry educator for its Hotels to HTMLs internet marketing workshops and book. For more information, please visit www.milestoneinternet.com or call (888) 350-8396. The quality work net gets wasted, is appreciated and awarded.